Explore Chicago on a custom tour, in the language of your choice, with a private guide in a deluxe vehicle that seats up to 12 guests. Arabic, French, German, Italian, Mandarin, Portuguese, Russian and Spanish speaking guides are available. You will see attractions such as the Loop, Museum Campus, Millennium Park, Lake Shore Drive, Wrigley Field or you can explore the neighborhoods with visits to Chinatown, Pilsen, Little Italy, University of Chicago/Hyde Park, Fulton Market’s restaurant and gallery scene. See world-renowned buildings by Frank Lloyd Wright, Mies van der Rohe, and Louis Sullivan and the world’s most beautiful skyline at your own pace in complete comfort. Your local guide and professional chauffeur will customize the experience for you. Your expert local guide and professional chauffeur arrive at your hotel in a luxury mini-coach with comfortable seating for up to 12 guests plus the guide and driver. Make sure to bring your camera while you head out on this tour. Your guide will give an overview of the options for your 4-hour tour. Let the guide know your preferences and embark on your custom tour but don’t hesitate to tell the guide when you’d like to get out and walk or when you need more time for photos. Loop: Daley Center, Marina City, Willis (Sears) Tower, Merchandise Mart, Harold Washington Library, Board of Trade, the Rookery, Art Institute, Chicago Cultural Center and Louis Sullivan’s masterpiece Auditorium Building. The “L” transit system, Chicago’s Public Art by Calder, Picasso, Miro, Chagall. Historic sites from the Great Chicago Fire, the Civil War and Abraham Lincoln, Gilded Age Mansions on Prairie Avenue, Prohibition and the Al Capone era, Route 66, the Daley “Machine”, Grant Park and Obama’s Chicago. Lakefront: Lake Shore Drive, Lincoln Park, Navy Pier, Museum Campus, Buckingham Fountain, Northerly Island, McCormick Place Convention Center. Stunning views of the skyline with plenty of time for photos. 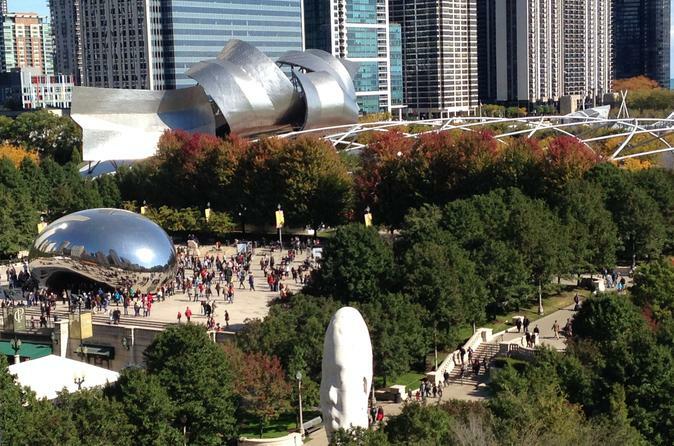 Millennium Park: Chicago’s new centerpiece park, home of “the Bean” (Cloudgate), the Crown Fountain, Frank Gehry designed Pritzker Music Pavilion and Lurie Gardens. Stroll thru the park as your guide explains the how this incredible “green roof” park came to be. Neighborhoods: Get off the beaten path and explore the city’s many ethnic enclaves. Shop Chinatown for exotic wares, see the Mexican murals of Pilsen, visit a deli in Little Italy or the stunning cathedrals of the Ukrainian Village. Nightlife: Chicago is city of “Foodies” and craft brewers. Fulton Market is home to some of the city’s Michelin rated restaurants alongside wholesalers in fish, meat, produce and trendy art galleries. If music is your passion, your guide can point out some of the best clubs for jazz and blues, playing nightl.